Matthew Paris was a monk of St Albans' Abbey, from 1217 until his death in 1259, about whom we know a great deal: he was a prolific chronicler of national and local events, from which we can learn a lot about him. Manuscripts such as this, in his own handwriting, demonstrate his interest in, and aptitude for, subjects are varied as geography, heraldry, and history, as well as his considerable abilities as a draughtsman. 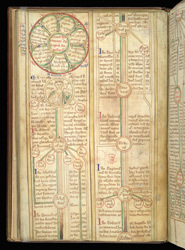 Following a series of images representing the kings of England, from Brutus to Henry III, is an annotated genealogy, showing the descent from King Alfred onwards. This is the first page, with Alfred 'the wise' depicted in the roundel.